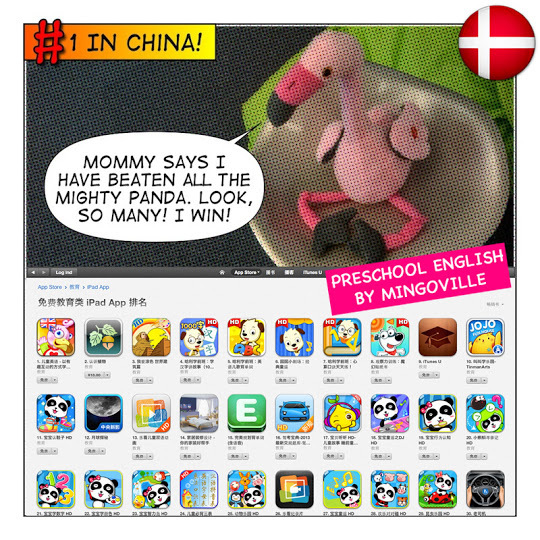 COPENHAGEN, 15 April, 2013 – We have knocked out the dominating Chinese panda education series app in the iPad App Store in China with our latest Preschool English app. Starring baby Flamingo, Andrea, the animated and interactive Preschool English by Mingoville app was pre-launched 10 days ago just for the iPad. The versions for the iPhone and Android mobile devices will be available upon its full launch. The app was quickly picked up by Apple, and awarded a new product feature spot in the China App Store in less than a week. It then gradually overtook the commanding presence of the panda in the education category and finished in pole last Sunday. “Our developers have worked extremely hard to develop a quality, savvy and fun educational app for preschool kids, we are only pleased it has been so well received in a foreign market as massive as China”, said Mingoville CEO Stephan Stephensen. Using native real voice actors and animation, kids will be on a mission to grow their vocabulary tree as they enhance their word recognition skills while playing the app. For their tree to grow, kids will have to complete several “missions”, each comprising of 12-15 interactive games and over 500 words to give them a sturdy foundation to learn English especially as a Second Language. Preschool English by Mingoville is at present free for download on iPad with in-app purchases but with the first mission made free-for-all to play. Can Schools Really Be Locked Out In Today’s Digital Age? In the midst of the on-going schools lockout in Denmark, we received an interesting email from an inquisitive 6th grader this week, Albert Einstein, he candidly calls himself. What struck me was the commanding level of critical inquiry in his email even if his feedback remains subjective to each his own but, it reveals how a child does not take his learning journey any less serious just because it is not in a “school”. This brings me back to the bigger questions: What exactly does a school lockout mean in today’s digital age? Can teachers – and education – really be locked out? Schools compounds may be locked up, teachers may be denied from teaching, but in today’s digital age, “school” never closes because what is “school” is no longer clearly defined by mere human, physical compounds and boundaries. For all the policy debate ensuing in Denmark, the irony is that, education is not locked out even as teachers are. It actually reveals a paradigm shift in motion. Since the schools lockout, Mingoville has seen a surge in interest, downloads and purchases in our educational apps on the iPad in particular – as of today – more than 30% of the Top 20 iPad apps in the Danish Education Store belongs to us. “It tells us that with a schools lockout, parents in Denmark are left to proactively seek out for their kids alternative learning means or should we say, alternative teachers to facilitate learning”, reveals Mingoville’s CEO, Stephan Stephensen. At this point, it is critical to point out that a schools lockout is not uncommon elsewhere in the world, though, for very different (often unforeseen) reasons. Just a decade ago, the SARS outbreak in Asia had forced schools to be closed, then there was the H1N1 epidemic just a few years back that had schools shutting too. I was teaching in a pre-tertiary institution in Singapore when the H1N1 epidemic called for a school “lockout”, and the lockout had to happen in less than 24 hours. Fortunately, I was teaching in a digital education-ready school. Instructions of e-learning plans were sent to teachers right away. For the rest of the week, lessons and assessments were conducted digitally, teachers simply “worked” from home. In a digital education age, the role of teachers ought to have taken a big shift. And perhaps central to the debate should be about such paradigm shifts in Denmark. Instead, burden has fallen on parents to stand in the gap to work out contingency plans for kids, as we saw a massive surge in private purchases of our products. “This intrigued us as one would expect schools in today’s digital age to be better equipped to ensure learning will not be disrupted. All it would have taken was a digital-learning contingency plan and the teachers to facilitate it,” he concluded. While adults fight their battles, let us not undermine a child’s ability to be serious self-directed digital learners — if this should add perspective to the debate, too. Because in today’s digital age, education never stops. The show will go on. Then what – really – are we fighting about? Mashable recently published an intriguing article on the use of “gamification” in education, highlighting its success, which sits perfectly with Mingoville’s learning philosophy in creating our “learn-through-play” e-learning products that are used in classrooms in several countries today. As advocators of (virtual) gamification in education, Mingoville embraces a learning philosophy where learning is both self-directed and learner-centered in designing our e-learning platforms – Mingoville English and Mondiso Maths – both have tasted success. However, while Mingoville English and Mondiso Math universes both had gamification applied in their development process, we went one step further, and have found the success of our platforms to hinge on the high quality of animation characters and real voice actors. Developing them, took over a million dollars but we believe it’s worth it. As it currently stands, our belief stems from understanding how gamification in education offers a holistic and cohesive learning approach as online learning materials are often fragmented and text-based. Our cohesive and dialogue-based game design approach not only enables a learner to begin to take ownership of their learning at a young age but is also an excellent trigger for focus and for lifelong learning. True learning is often inspired, gamification in education can do just that. Yet as one of the pioneers in virtual gamification in education, we say to reach the full potential of gamification, virtually at least, requires for game developers to pay attention to the quality of the multi-sensory experience in developing its equally high quality cohesive content. Mashable.com: Does Gamification Help Classroom Learning? I remember when I was growing up, heading to the school’s computer room for an hour of IT activities each week was a highlight of my school week. Fast forward two decades on, it is interesting to note that not only do students find having a tech-savvy day at school a luxury, teachers are buying in to “actively using technology to make their work more effective”. Technology has evolved from being an extra-curricular activity to what teachers are using to “facilitate and enhance the learning and teaching processes”. This evolution aligns with Mingoville’s heartbeat no less. When we launched Mingoville e-learning English virtual world in 2007, it was the beginning of our commitment to position our products as the preferred literacy development supplementary tools for teachers across the world. We achieved a milestone in 2009 when we teamed up with the Chilean Ministry of Education to implement Mingoville English e-learning in schools. If you are from a school, a city, a province or a country searching for tech tools in your classrooms, we may have exactly what you need. Write to us. While there is no doubt that technology is invading classrooms at lightning speed across the world, the integration of e-learning curriculums with tech remains in its early days. Any new machine for education is increasingly only as meaningful as the content it offers. At this point, we remember already back in 2009, Mingoville had teamed up with the Portuguese government (Ministry of Education) to integrate our award-winning Mingoville English e-learning program for children on half a million Intel’s Classmate PCs in Portugal. The Portugese Government had conceived an ambitious and realistic plan to provide all school children with an affordable (or in some cases completely free of charge) laptop. Besides Portugal, 10 laptops were ordered to be sent to Kosovo and 1000 pieces to Botswana. It feels a revival of some sort lately, or potentially an aggressive trend in ICT for education on the rise, with Apple’s education-focused iPad and News Corp’s development of an education curriculum to integrate into their Amplify machine for schools. Exciting times ahead. This spring, we will be releasing a preschool edition app of our Mingoville English e-learning product, which will be available on iOS and Android. As one of the pioneers in providing ICT English and Math education content, we are definitely ready to be part of the game. Mingoville School Edition is here! Download for iPhone and iPad now! Merry Christmas to All from Savivo!